Ever after. Imagine the library down the hall. Courtesy of Google Images. ME: Can we have a library in our house someday? BEAU: We already have a library. BEAU: If a library is a room full of books, Library #1 is our living room. Library #2, the bedroom. Library #3, the office. ME: (dreamily) It would be all tall, gorgeous shelves full of books with comfy overstuffed chairs. BEAU: And maybe the bathroom is Library #4. ME: Hmph. Not what I meant, punk. This got me thinking about beautiful libraries. I love libraries, and beautiful libraries are even better. The first one that popped into my my is the gorgeous library at the monastery in the movie Ever After. I can’t find a picture of that exact library, but it is multiple floors and open to the working area where the monks are making new copies of the books (this Cinderella movie is set hundreds of years ago). Danielle, our Cinderella, lights up as she tells the story of falling in love with the book Utopia by Sir Thomas More. Hogwarts Library. Courtesy of Google Images. 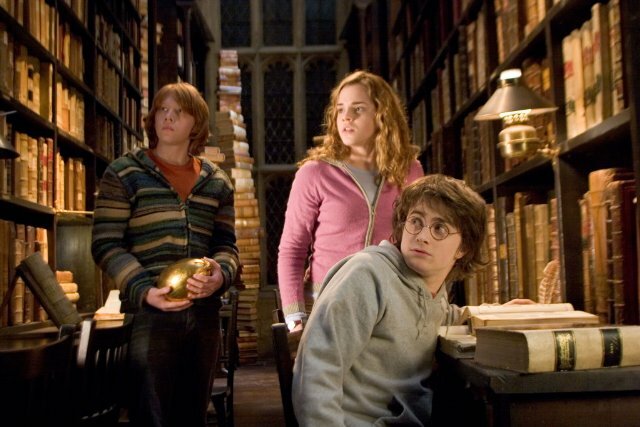 The omnipresent library of the Harry Potter books (and movies) also deserves a nod. Major props go to JK Rowling for working the library into every book in the series. 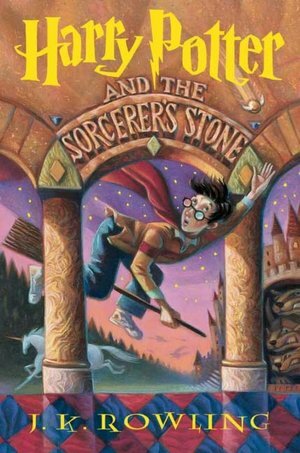 Harry’s good buddy Hermione manages to find out something important from a book that moves the plot forward in every story in the series; the library is practically a character in the books. Belle in the town book shop. Courtesy of Google Images. 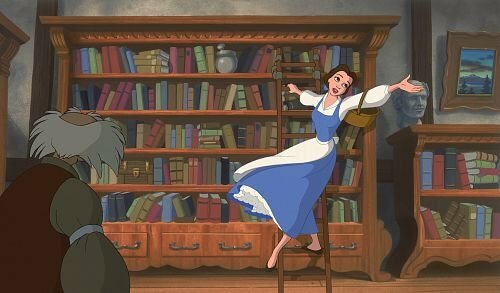 There are also a couple of fantastic libraries in Disney’s Beauty and the Beast (side note: I can’t believe this movie is more than 20 years old). As a kid, the fact that Belle adored reading made me love her more. Who could forget the charming town book shop or the luxurious library at the Beast’s mansion? For some real-life beautiful libraries, check out this slideshow of twelve stunning libraries. Which libraries (real or imagined) do you think of when you think of libraries? Posted in Culture and tagged architecture, Beauty and the Beast, books, Drew Barrymore, Ever After, Harry Potter, JK Rowling, libraries, setting, Sir Thomas Moore, Utopia. Bookmark the permalink. As writers, we always want to weave our description into the story just enough to make it vivid but not so much as to slow the story down. While Dickens may have been able to get away with an entire chapter about fog in Bleak House, modern authors usually can’t get away with that and still sell books. We frequently hear about including the senses in our writing, but we need to remember to include descriptors that have a purpose. Does it create a mood? Does it tell us something important about our characters? Does it move the plot forward? Is it important later in the story? Maybe the image of a gorgeous orange leaf floating down to a pond captivates your imagination as an author, but does it make sense for the story you’re writing? If your character is zipping by that leaf at 60 miles per hour on her way to a family member’s death bed, perhaps that’s not the moment for that particular image. At midnight, the dogs, cats, and rats rule Venice. The Ponte di Ghetto Nuovo, the bridge that leads to the ghetto, trembles under the weight of sacks of rotting vegetables, rancid fat, and vermin. Shapeless matter, perhaps animal, floats to the surface of Rio di San Girolamo and hovers on its greasy waters. Through the mist rising from the canal, the cries and grunts of foraging pigs echo. Seeping refuse on the streets renders the pavement slick and the walking treacherous. It is an odd time; something must be wrong. Hannah lives in the super ghetto. Literally. Something creepy is about to happen. The author gave us all of this information without telling us directly. She uses multiple senses to show us the environment, set the eerie mood, and drop hints that something is about to happen, all at a bridge that comes up in the story again and again. She pulls the reader in. What have you read recently where the description jumps off the page? What do you think makes for good description? Check out an in-depth review of The Midwife of Venice here. Like the reviewer, I also think it’s pretty cool that the book shows both good and bad Jews, Christians, and Muslims — it’s not just one religion versus another. 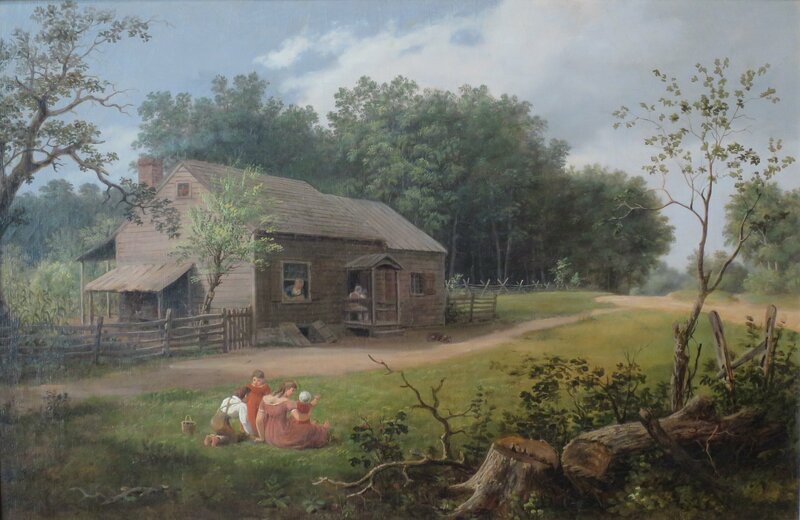 Posted in Craft and tagged Bleak House, Charles Dickens, description, detail, mood, Roberta Rich, setting, showing vs telling, The Midwife of Venice, the senses, writing. Bookmark the permalink.